Eagle Heights Woods, a 28-acre woodland parcel located at the northwest corner of the campus, sits atop a bluff overlooking Lake Mendota. The forest community here is among the loveliest in the Preserve—the towering oaks and the spring bloom of ephemeral flowers attract the casual hiker and the student of ecology alike. Native Americans have long revered this place: three sacred burial mounds were constructed here over a thousand years ago. Perched on a 150-foot high bluff with long lake views, Eagle Heights must have been as inviting to the early people of this area as it is to us today. Three Indian burial mounds at the highest point on the Eagle Heights bluff suggest that this place has long been attracting people, since they were made perhaps as much as a thousand years ago. All three mounds are visible from the walking trail that circles the top of Eagle Heights Woods. The Winnebago name for Eagle Heights was Sho-heta-ka (horse hill). They believed that this highest hill on the shore of Lake Mendota was inhabited by a spirit horse. It could be heard neighing and stamping its feet at times. On cloudy or misty days its form could sometimes be seen on top of the hill. Being a sacred place, some of the Indians went to this hill to fast and dream and to gain inspiration and power from this spirit horse. No Indian has seen the horse for many years. The reverential attraction of this high place may still be observed. Occasionally small packets of tobacco are tied to trees in the woods. This traditional sacred offering reminds us of the diverse spiritual practices in our community. It is important that we respect and preserve both the ancient and modern sacredness of this place; please remain on the trails and do not walk on the mounds. Casey Brown (Ho-Chunk) ties a prayer bundle by Jeff Miller/UW-Madison. The earliest European-American landowner to shape the Eagle Heights Woods landscape was George Raymer. Raymer purchased a large farm in 1887 that extended to the lake on the north and to present-day Lake Mendota Drive on the east. Soon after acquiring the property, he built a network of “pleasure drives” for carriages to travel around his farm, which he opened to the public for their enjoyment. Several years later these, pleasure drives were incorporated into the newly formed Madison Park and Pleasure Drive Association’s routes. Today the original Raymer pleasure drive network can be retraced today along Eagle Heights Drive, Lake Mendota Drive, and a segment that ascends into Eagle Heights Woods and loops around the Indian mounds. While Raymer probably used the flat areas of his farm (where Eagle Heights Apartments are located today) for growing crops and grazing animals, we do not believe that he ever attempted to log or put the steep-sloped Eagle Heights Woods parcel into agricultural production. By 1911, Raymer decided to sell his property to the university for use as an agricultural research farm. (See the Tent Colony Woods page for more details about this controversial land acquisition). The plan for the house on Eagle Heights was abandoned when Young died unexpectedly in 1948. Three years later, the heirs to the Young estate sold the 28.2 acre “Upper Eagle Heights Woods” to Thomas Brittingham Jr. In turn Brittingham, a trustee of the Brittingham Trust, turned the property back over to the university. 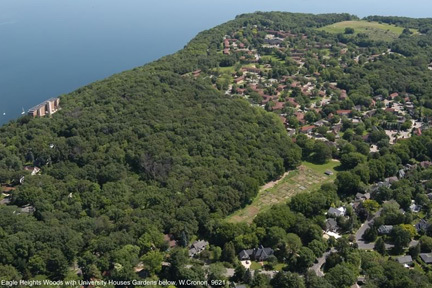 The “Lower Eagle Heights Woods” portion of the property (on the north side of Lake Mendota Drive) was retained by the Young family and was later sold to the developer of the Cove Condominiums. This decision to separate off the shoreline portion of the Eagle Heights property set the scene for a contentious land-use battle in the 1980s—resolved with the eventual acquisition of Wally Bauman Woods. 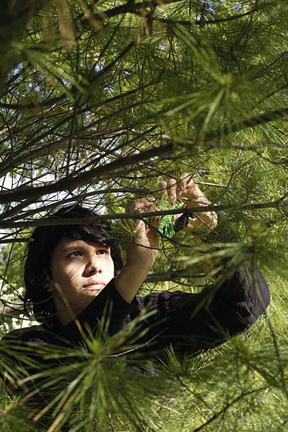 Read more about Native Americans and the Preserve. To learn more about the history of the Eagle Heights area, see Thomas D. Brock, “Eagle Heights,” Historic Madison: A Journal of the Four Lakes Region 12 (1995), 37-44. Read more about Native American legends as recorded by Charles E. Brown: “Lake Mendota Indian legends: prepared for the use of students, University of Wisconsin summer session” Madison, Wisconsin: The Museum, 1927. 6 p.; 20 cm as in the UW Digital Library Collection. Read about Thomas E. Brittingham Jr., who as trustee of the Brittingham Trust provided the funds to purchase Eagle Heights for the university in 1951. Brittingham’s commitment to the Scandinavian student scholarship fund is commemorated with a runestone atop Muir Knoll. “The University Loses a Great Friend and Benefactor.” Wisconsin Alumnus, 61.14 (June, 1960): 12-13. “The Brittingham Trust,” Sheboygan Press, January 18, 1951. Eagle Heights Woods is unlike most of the natural areas within the Lakeshore Preserve. Groves of oak trees grow tall here and a diverse plant community thrives in the understory. A combination of topography and land ownership history combined to protect this area from many of the human activities such as agriculture or construction that have altered plant and animal communities elsewhere. 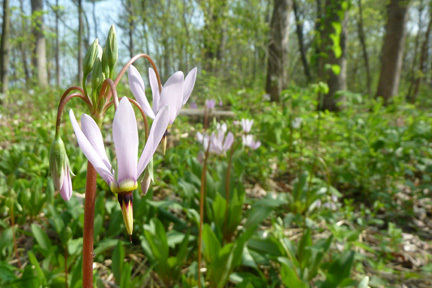 Shooting star, trillium, and wild geranium are but a few of the many spring ephemerals that can be enjoyed here during the early spring. Mature hardwood forest trees, such as white oak and hickory, create a thick canopy overhead. 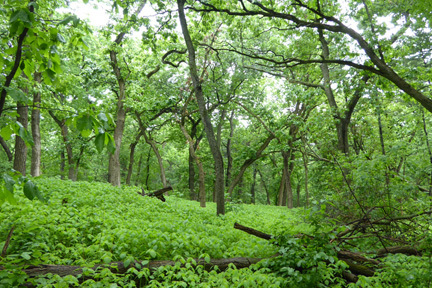 The woods are not immune, however, from the ecological challenges of invasive species such as buckthorn, honeysuckle, and garlic mustard. Hard-working volunteer efforts, spearheaded early on by the energetic team of Kathie and Tom Brock, have made significant progress towards preserving and restoring the native plant community here. Shooting stars on Indian burial mound. Photo by Bryn Scriver. Oak trees in Eagle Heights Woods. Photo by Bryn Scriver. Eagle Heights Woods has long been a favorite hiking, jogging and birding destination for visitors—especially among our neighbors from the Eagle Heights Apartments, University Houses, and the Village of Shorewood Hills. Given the numerous trails—some of them left over from George Raymer’s carriage roads—it is possible to take several circuitous routes through Eagle Heights Woods. Search for “Eagle” in the interactive map to see the trails. Most trails run along flat or gently sloping grades with the exception of the segment between the trailhead at Lake Mendota Drive to the top of the bluff. In inclement weather, this stretch of trail can be quite slippery. Visitors are reminded that dogs must be on a leash anywhere on university property. Bicycles are not allowed anywhere in Eagle Heights Woods. A trailhead to Eagle Heights Woods is located on the south side of Lake Mendota Drive near the intersection of Eagle Heights Drive (the east-west road that cuts through the Eagle Heights Apartments complex). Campus bus #80 makes regular stops near the Lake Mendota Drive trailhead to Eagle Heights Woods. Eagle Heights Woods can be reached by taking Lake Mendota Drive to the trailhead near the intersection with Eagle Heights Drive. 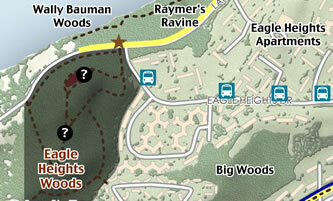 Hikers can reach Eagle Heights Woods along the Lakeshore Path approaching from the east. Before you reach Wally Bauman Woods (where the Lakeshore Path terminates) take the short spur trail to you left and up the slope to Lake Mendota Drive. The Eagle Heights Woods trailhead is directly across the drive. If you choose to drive to Eagle Heights Woods, you may park in the short-term lot at Raymer’s Cove and access the woods along the Lakeshore Path. Please do not park in the permit-only lots at Eagle Heights Apartments. Parking is not permitted on Lake Mendota Drive.